As much as I hate to admit it, I think we are done sailing for the season. NYC has been amazing for the first part of November with her temps hit 75 degrees multiple days. 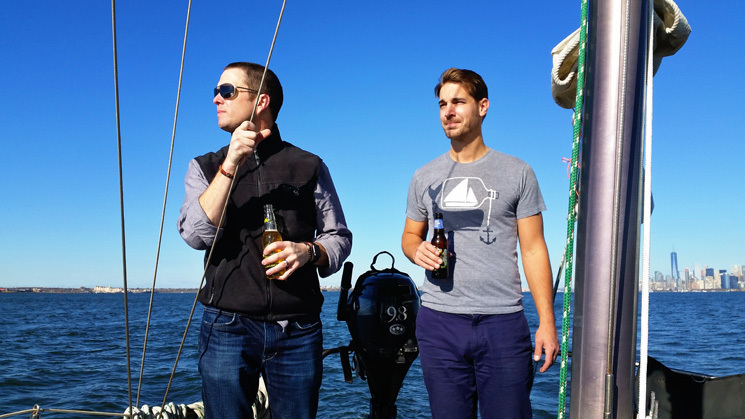 With the weather forecast sadly returning to more normal Fall temperatures the coming week, we wanted to take FULL advantage and spent the whole weekend on the water while we could. Jason and I are both exhausted, but so glad we headed out both days. Jason’s brother was in town from Oregon and we were so excited he was able to come out for a sail. Danforth, Chancelot and the NYC Skyline. Sunday was nearly perfect out. 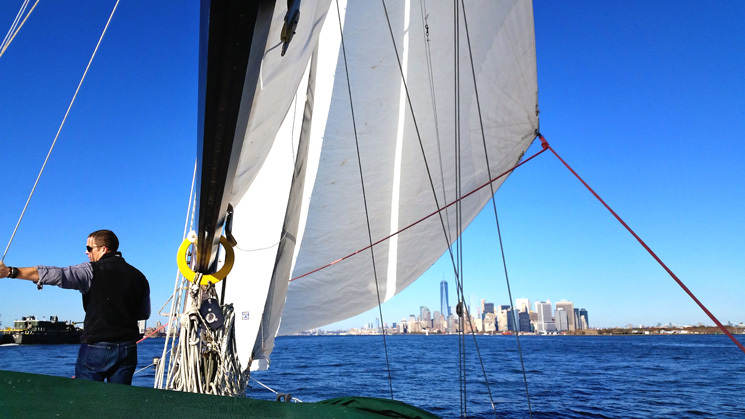 The typically bad NYC wake was pretty calm given a lot of pleasure boats are already winterized, and we seemed to catch the tide going both ways on our sail. 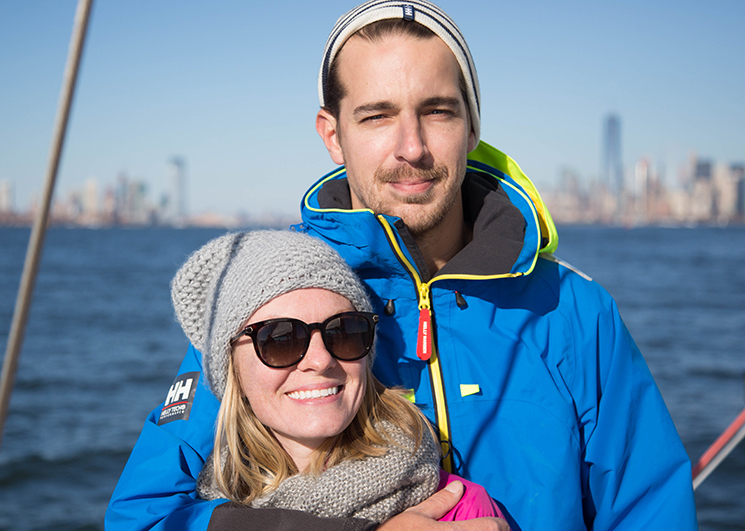 Jason’s brother, Danforth, was in town for a conference and we wanted to show him New York from our perspective. 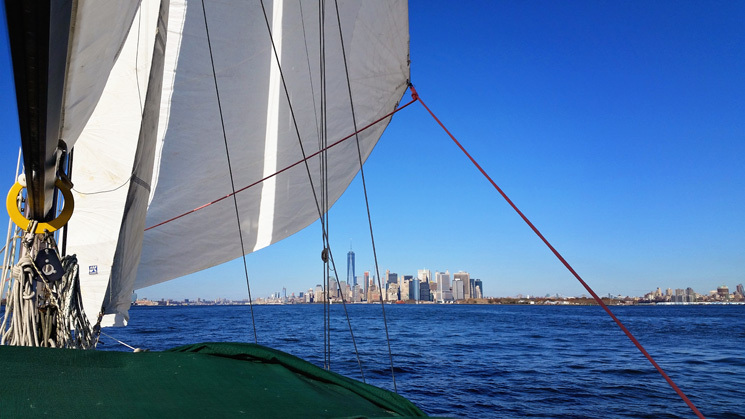 We sailed along downtown Manhattan, passed the Statue of Liberty, next to Governor’s Island and got a little nervous when a couple State Island Ferries came a little too close for comfort. We were on our way towards Coney Island when we saw the USS New York. 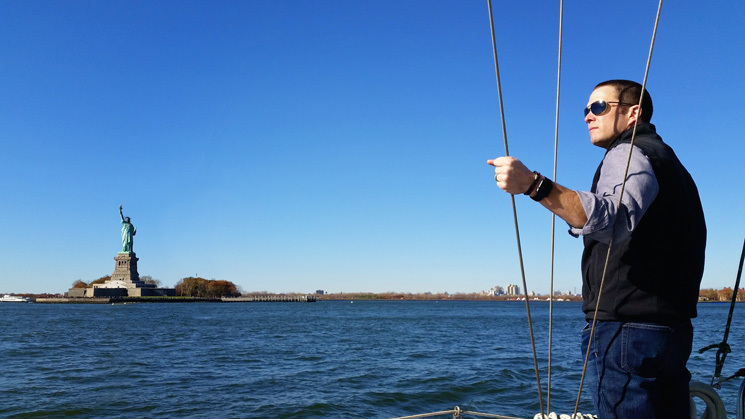 I was at the helm when I first heard the call on the VHF, and then as we rounded the bottom of Manhattan I saw her barging her way under the Verazano Bridge. If you have never seen a Naval ship, it is quite impressive. Leading a parade was the FDNY Fire Boat spitting 50,000 gallons of water a minute. Yes, I said 50,000 gallons A MINUTE. It seriously was a spectacle. After that you had a couple NYPD Boats, and then you had the USS New York. Legally you can’t get super close to the USS New York, and once I spotted the machine guns I wasn’t leaving anything to chance. We were planning on heading under the bridge, but once we saw the parade we did a 180 and tacked our way back back up the Hudson. 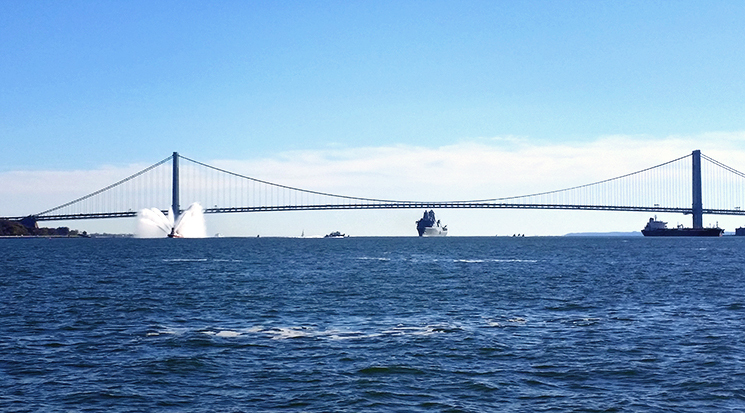 The USS New York is nearly as tall as the Verrazano Bridge! Two of my favorite boys. Beers, brothers and a tiny NYC skyline. 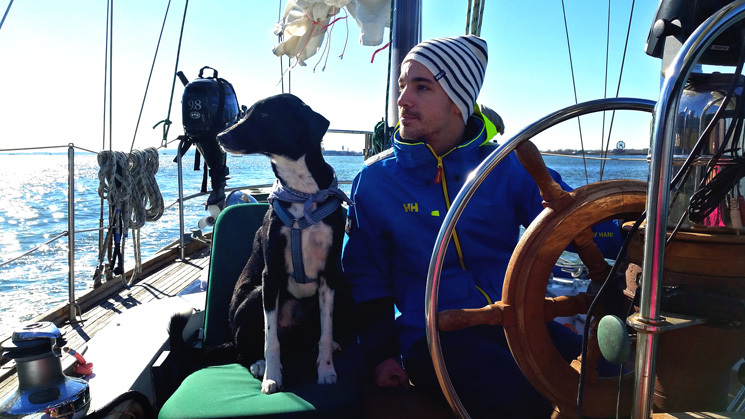 We were lucky that our new friend Haley was able to join us on our sail as well. 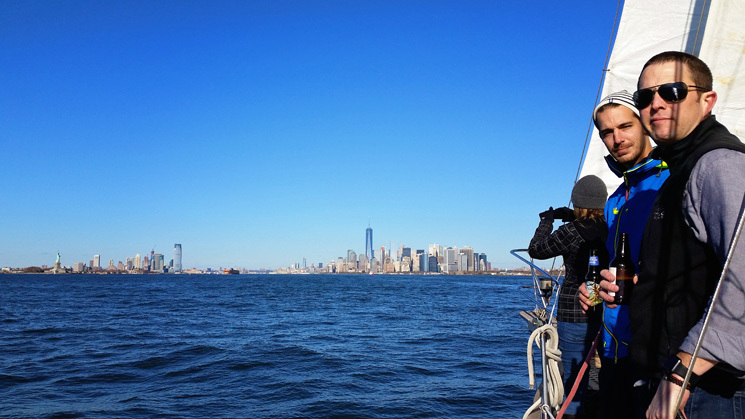 Hayley is a photography grad student doing her big project on the liveaboard life and we invited her out for the day. She’s done her fair share of sailing, but has never lived aboard. We’re doing our best to show her what it is like for us. Our marina has a lot of people who stay aboard, so she is getting her fair share of different perspectives! 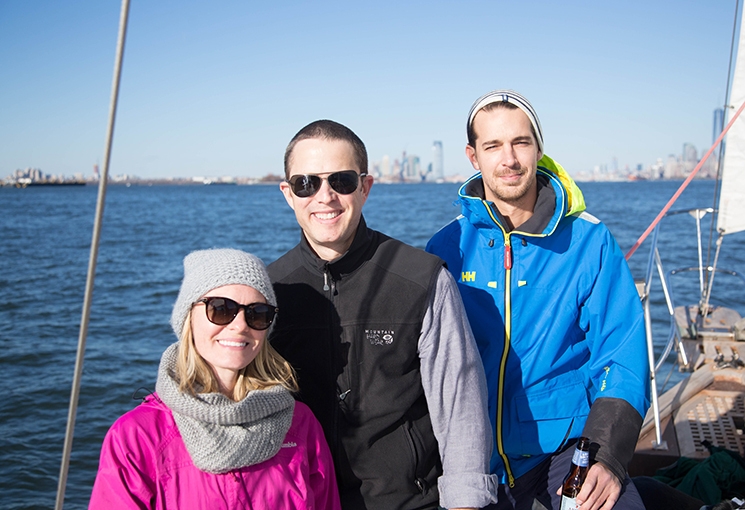 It was nice having an extra set of hands aboard, but it was really nice to have a photographer capturing our day, even if it was the last day out for the season. This city really does provide stunning photo ops. It figures that our last weekend out is when we would finally master docking. Don’t get me wrong, we’ve successfully docked many times, but we finally did it smoothly, multiple times, without either one of us freaking out momentarily. Each time I tied the aft spring line in the right spot, and secured the bow line just in time to run back to the stern line and get that cleated off. Jason is really starting to “feel” the boat as we slowly inch our 42′ boat through the 50′ channel back and forth until we are tucked nicely in our slip. Docking is easily one of the most stressful sailing activities for me. Better late than never, right? While we may be done sailing for the season, we are definitely not “done.” We have so many projects planned to get this girl back to her rightful glory. Come this Spring, she’ll be as pretty as we know she can be! We’re starting to prioritize projects so we can stay on track. Not only will we be living through our first winter aboard, we’re going to be starting some pretty big projects. Be sure to follow along, and please, please please wish us luck! Hi, Kelley and Jason! Just finished reading your entire story, from the beginning and loved every minute of it! You guys are a brilliant team. I really enjoyed how Kelley jumped right in and learned things, that just kept me grinning. And Jason, wow! You’ve got skills! I’ve been messing about boats since I was a kid and know how it feels to be on the water. There’s no place I’d rather be. I don’t own a boat, but I’m blessed that many friends do! Who knows? Maybe I’ll run into you some day, somewhere. Best to you and the pups always. Fair winds and following seas! How sweet of you to say! So glad to have you following along!